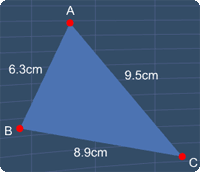 Which of the following triangles are isosceles triangles? 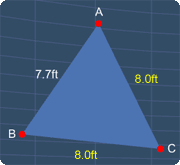 For triangle I, it has two sides of equal length (8.0ft). Hence, it is an isosceles triangle. 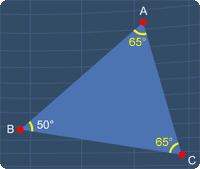 As for triangle II, it is an isosceles triangle since its base angles are the same. 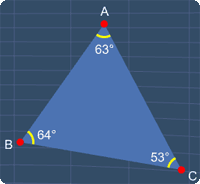 As for triangle III, all the sides have different lengths. Therefore, it is not an isosceles triangle. 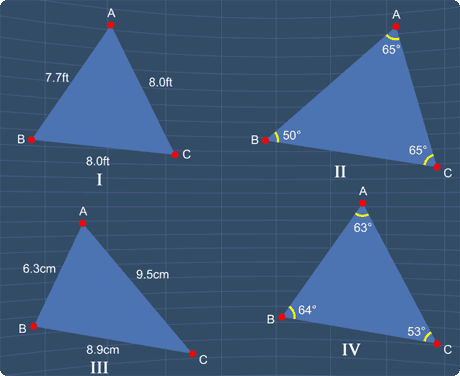 For triangle IV, all the internal angles are different. This means that all the sides of the triangle do not have the same length. Hence, this is not an isosceles triangle. Clearly, only triangle I and II are isosceles triangles. Therefore, the answer is A.